Top quality gear is an investment. You pay a bit more for better materials and construction. You expect your gear to last longer. Manufacturers like us strive to build the best products. We use quality materials and hardware. We invest in better construction. Even the best components will wear down if not properly maintained. Occasional, minimal upkeep will extend the life of your gear. You wouldn’t buy a car then neglect to wash it or change the oil, would you? Zippers are a common fail point on backpacks. Even YKK zippers, regarded as the best brand (and the one that we use), will benefit from upkeep. When properly cared for, zippers can outlast backpacks. Today we’ll discuss how to keep your bag’s zippers running smoothly. The first step to proper zipper care is to not overwork them. Overstuffing your pack can put stress on the zippers, especially when closing the pack. Do not use the zipper to exert force. If your bag is full, pull the material together with your hands, then zip it closed. Do not use the zipper to force your bag closed. The same logic applies when material gets caught in the zipper. Don’t force it. Back the zipper out of the snag if possible. Use your hands to pull out the problematic material. Then try the zipper again. Never force the zipper past a snag. You will only make the problem worse. Reduce the force exerted on your zipper by pulling from the metal pull tab, not from any fabric pullers or loops. 45NRTH illustrates the ideal way to pull on a zipper in the below picture. The proper way to pull a zipper to minimize stress. Via 45NRTH. “Silent” zippers without metal pull tabs have worse leverage than zippers with metal pull tabs. Always using perfect form when zipping and unzipping your pack isn’t practical. Just remember that the gentler you are with your zippers, the longer they will last. Getting dirt and grit caught between zipper teeth is a common problem that will cut short a zipper’s lifespan. This problem is more common is dusty environments. 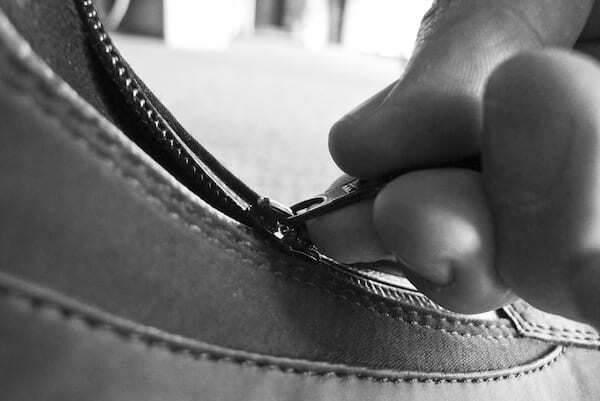 Keeping your zippers clean is easy and requires minimal work. Dirty zippers are common in the outdoors industry, so we turned there for advice. Tent zippers are often left on the ground and get stepped on by dirty shoes. Hiking backpacks are exposed to more dirt than travel packs. Clean your zippers with water and soap, like Dr. Bronner’s. You can hand wash your backpack and its zippers with a washcloth. Wash the zipper with more force at any stubborn, dirty spots. Make sure to remove anything caked on to the teeth or obstructing zipper movement. Dry your bag and zippers throughly after washing. Make sure to follow the care instructions on your backpack. Also, clean your pack’s zippers after being near the ocean. Salt can be corrosive to zippers. Rinse zippers with fresh water after exposure to salt water or to sea air. A quick rinse and dry will prevent long-term damage from salty air or water. So far, we’ve covered basic use and cleaning. Lubricating your backpack’s zippers can be a helpful preventative measure and next step. By lubricating the zippers, you’ll keep them running smoothly. Always clean the zipper before applying any lubricant. You don’t want to trap dirt in the zipper. You’ll find plenty of different advice on what to use for lubricant. Ask Metafilter recommends paraffin (candle) wax, powdered graphite, or crayons. Zen Backpacking recommends beeswax softened with a hairdryer or heat gun to make it easier to apply. Others recommend Teflon Silicone Lubricant ($10). For a dedicated, silicone-free product, try McNett’s ZipTech (solid, $8) or ZipCare (liquid, $6) zipper lubricants. McNett designed both products for use on wet suits. They should easily be able to handle the zippers on travel bags. You can extend the life of even the best zippers with occasional maintenance and responsible use. Be gentle with your zippers and never force them closed or past a snag. Clean zippers with water and soap after any extended trips to remove dirt and salt. To prevent future problems, apply a zipper lubricant after cleaning.